Hand Painted Bluebirds Watering Can Mini memory lamp. 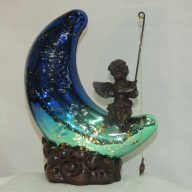 Bluebirds Mini Watering Can Accent Lamp, metal and glass for anyone who loves gardening or birds. The beautiful glass front has a hand painted picture of two bluebirds sitting on what appears to be a cherry blossom tree. This beautifully designed lamp has a dark bronze finish with droplets of blush color and is metal. The handle and spout on this gift of light complete the authentic look. 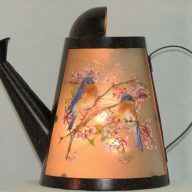 This is the small version of our large watering can lamp we usually offer and therefore fits anywhere. 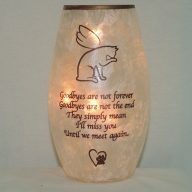 A wonderful gift in memory of a loved one who enjoyed gardening and the outdoors or to honor a special occasion. 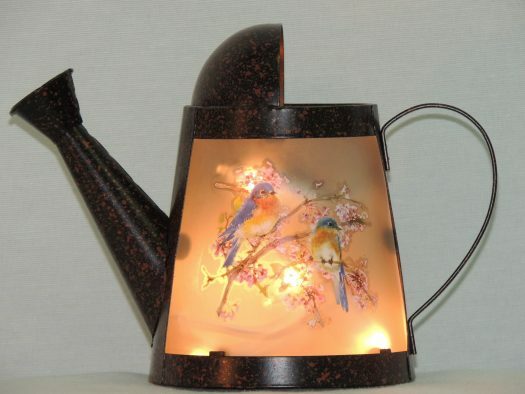 You light this Bluebirds Mini Watering Can accent lamp by plugging it directly into the outlet. Lighting comes from a miniature light set coiled inside this gift of light and has 8 bulbs. Most importantly, there are 4 replacement bulbs included. For your utmost safety, there is a 3 Amp, 125 Volt fuse in the plug, with an extra included.